Map Bio - After the Empire discovered a Secret Rebel base on Hoth and drove them from that world, they left behind many ruins. While the blizzards and ice storms common to Hoth have buried much of the former Rebel base, the ruins of a Shield Generator still stand tall over the Hoth landscape. It now stands as a landmark for all those who travel to this mostly barren planet and as such has been sought out by those who come to Hoth. The shelter provided by the ruins is not much, but is still valuable and thus sometimes fought over. Here are some shots in real time of the map. Last edited by TREX; January 24th, 2016 at 01:24 PM. So I just finished building this map and first impressions are quite positive. The castle wall sections are positioned such that it is almost impossible to draw LOS from one start zone to the other so no worries about a sniper just sitting in one start zone and attacking the other one. Lots of nice spots for a Jedi to force leap into battle from behind cover or Hoth Han to run around blasting people. 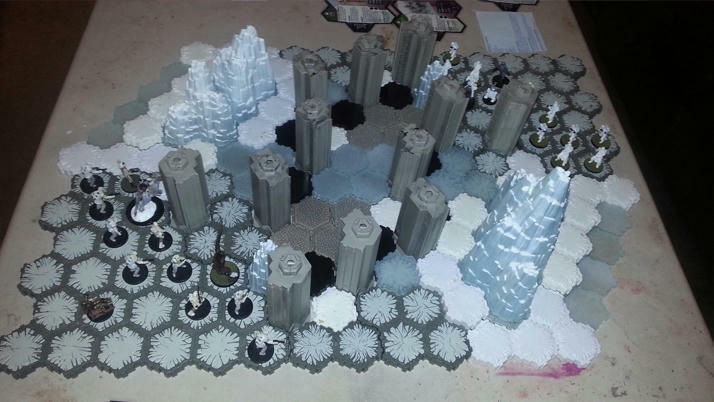 I normally don't play with the Heavy Snow & Slippery Ice rules in my games as it just makes it harder on melee figures but I really think it would fit this map well since it is such a small map to begin with. It would also make you consider dropping into shadow and giving up high ground when trying to move up as that may be the faster route forward. It also means those units with the snow movement power will be able to quickly swing around the ice rocks to flank an opponent, really boosting those units effectiveness. Most of the snow for snow bonuses are off to either side but it has a few single snow tiles spread about for those units that benefit from snow. The high ground on either side of the map will ensure both teams spread out too rather then just rushing down the central corridor. The theme really comes through quite well too IMO, as it looks like some ruins that have been overtaken by ice and snow. Having a two part campaign featuring this map and the Abandoned Echo Base might be something fun to set up one day. 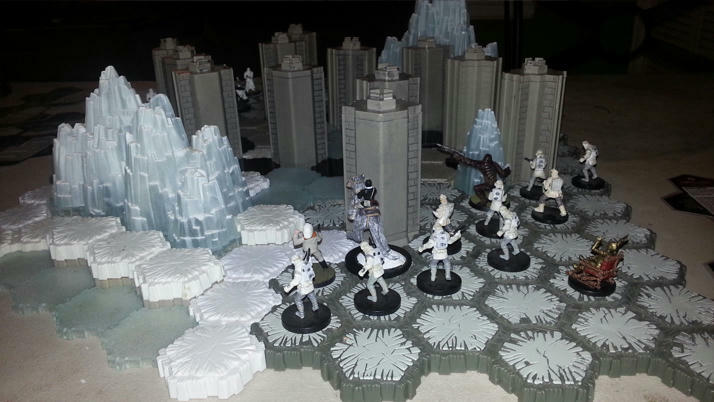 Including the Wampa cave for a 3 part campaign could work too. It looks great! Too bad I don't have any of the sets needed to built it. Maybe OLS? And the Lord said unto John, "Come forth and you will receive eternal life." @Yodaking it was a very fun map before I put in vs, the tweaks you made only makes it look more fun. Ill have to rebuild it and give it another go. FYI, I think you have enough votes in the other thread to make this thread official. After building this map and using it for some testing today, the only suggested changes are minor ones. 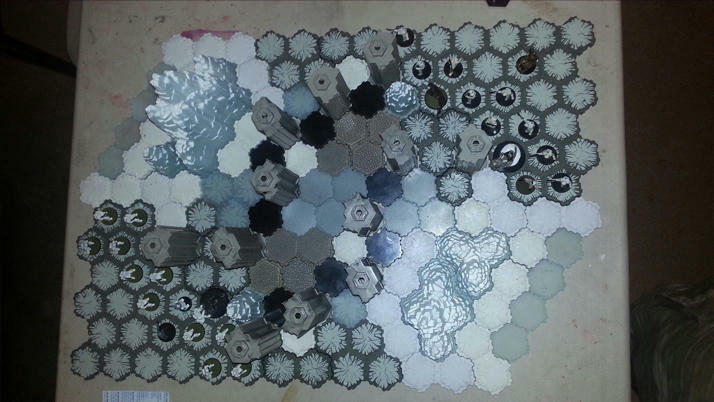 The castle wall ends are a bit unstable as they only lock in to one tile and are sitting straight on the table rather then a hex. So I would recommend just swapping them out for corner wall pieces, then they will lock in to two tiles and be less likely to tip over. 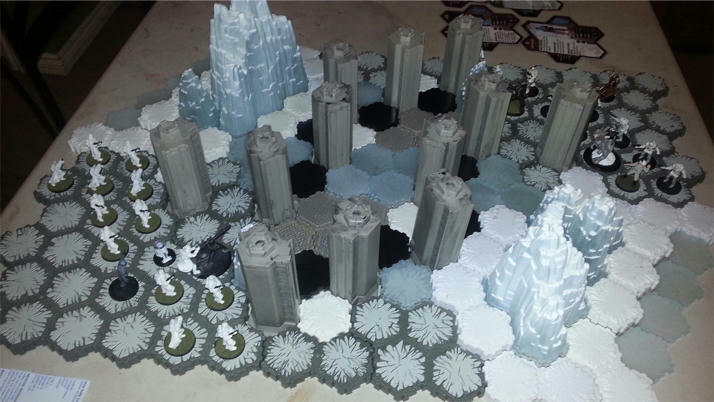 Then I had to rotate the 3 hex ice rock as the way I had it on the table left a gap between the 3 & 4 hex ice rocks you could see through. Once you turn it to have the highest portion of the 3 hex ice rock closer to the 4 hex ice rock, the combined ice rock structure becomes fully blocked up just like the 6 hex one. If this map gets moved into public play testing without any significant changes I can write up a PT report for it. Don't let that discourage you from making changes though. @Porkins , Just print the build instructions, I currently do not have a program that I can make pdf's with. Its fast pace, to flank your enemy you have to trudge through the snow, to take them on full frontal there are lots of LOS blockers. I think you will like it. I did. As this is a competitive map, I do not have any scenario rules for this map. What needs to happen so I can move on. If you are happy with where the map is at, you can call for a vote for public play testing. I can write up a test report based on my use of the map, then you will need a couple more people to test it. You can do one of the tests yourself too if you want. We need to get some tests done and confirm it's competitive balance as well as it's fun factor. Feedback from the tests will let us know if something needs to be changed or if it's good to go as is. sounds good @Yodaking , I'm happy with the map, I think we should proceed. I'd like to call a vote for this map to reach the public play testing phase. If any of us come up with a scenario type situation for this map later, we can add it later. As for now, I would like to play test it as a competitive type map. Last edited by TREX; March 19th, 2015 at 08:34 PM. Bold the proposal & change the thread title to reflect the vote call.